Shameless plug - but come and visit, though!! Very excited to announce that I am participating in a group show at Creative with Nature. For this exhibition - and since I am showing at an art gallery that works with nature - I pondered upon how that would apply to me. Fortunately, the pondering didn’t last long. Thoughts soon directed me to my love of plants. I’m not very good with plants and I am not a gardener. Something about a slug war and chopping worms into two that doesn’t agree with me. House plants can get a little neglected too, yet they complement a house so much! So my answer to this problem is to paint them instead to enjoy them that way! The exhibition launches with an event on Friday, 5th April between 6 - 8 pm and will run until the 25th May. You are invited to the event, so please come along if you around! There will be free flowing booze, nibbles as well as art to feast your eyes upon! I will be showing my work alongside the wonderful wicker worker, Joe Gregory, as well as fantastic artists, Maria Clancy and Naomi Neale who both work in watercolour depicting nature and wildlife. Hello everyone, happy 2019! May the new year bring health, happiness and abundance in bucket loads to you! So, it’s resolution time and I’ve been over eating recently and am starting to cultivate a splendid double chin, so the New Year’s Res is to eat less and to eat healthy and don’t give in to my tummy that reckons it’s hungry every time it gurgles. There is enough weight on my chin to last for days without truly experiencing hunger. 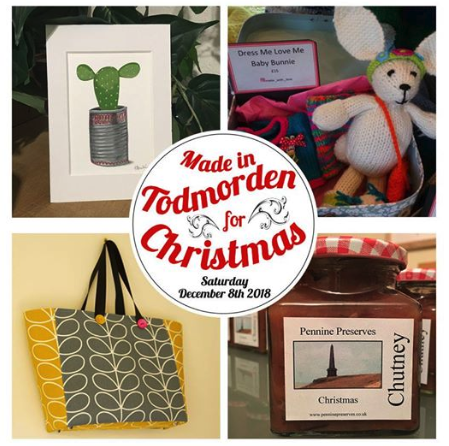 TodConnect Art & Craft Fair and Promo Discount! The next outing my original illustrations and artprints are gearing up to be part of, will be the TodConnect Christmas Art & Craft Fair. This event will take place this Saturday at The Old Co-op in Todmorden and starts at 10am and finishes at 4.30pm. Had a fantastic time at the Manchester Art Gallery Christmas Art Market last night when I was sharing my stall with Phinefibre Art, Josephine Gornall. Despite it lashing outside, we both had a successful evening, met some lovely fellow artworkers/designers and sold a lot of work! A huge thank you to the organisers and to those of you who bought our work. Looking forward to next year’s event already!